Emergency situations call for the highest level of attention to infection control and that’s where our Vinyl Short Term Use Blood Pressure Cuff offers you the perfect, affordable solution. Designed to be durable enough for short-term use, these cuffs are custom-designed for easy application and cleaning so that you can focus on saving lives. Our Vinyl Short Term Use Blood Pressure Cuff offers an affordable blood pressure cuff solution for clinical areas where cleaning and disinfection are especially important, whether during a procedure or in an emergency situation. Easily cleaned yet durable enough for short-term use, our complete line of vinyl blood pressure cuffs are more economical than traditional vinyl blood pressure cuffs. Easy Disinfection: Cuffs are made with vinyl material that can be easily cleaned and disinfected. Economical: Lower cost than traditional durable cuffs makes short-term use affordable. Ease of Use: Tapered end for easier cuff application, color-coded for quick size selection, and interior & exterior range indicators ensure accurate cuff sizing and fit. For more information on these cuffs or to request a quote, just click here and learn how we can be the difference in clinical grade for you! 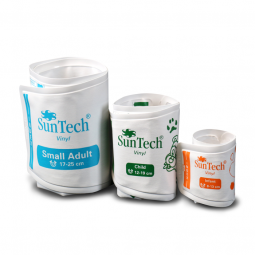 SunTech Medical's Family of Cuffs brochure detailing our full blood pressure cuff line. Instructions for Vinyl BP Cuffs in English, Dutch, Spanish, French, Italian, Netherlands, Portuguese (Brazil), and Chinese. Why is it important to use the correct size cuff on my patients? 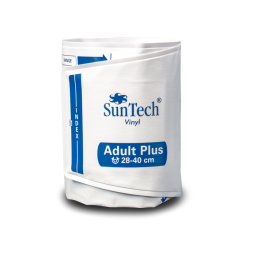 SunTech Medical Cuffs are designed to meet the AAMI (Association for the Advancement of Medical Instrumentation) clinical standards for blood pressure cuffs. These standards were devised in order to ensure adequate pressure on the artery of the upper arm, which is necessary to produce an accurate blood pressure measurement. If a cuff is used on an arm larger than the specified range, the resulting reading will be falsely high. If a cuff is used on an arm that is smaller than the specified range, the resulting reading will be falsely low. How do I clean the Vinyl Cuffs? The following cleaning methods have been applied 20 times to the cuff without any apparent negative effects. Medical Disinfectant Spray - The cuff may be sprayed with a mild disinfectant solution (e.g. Cidezyme®, ENZOL®, or 10% bleach solution), rinsed with distilled water and line dry. Ensure that no liquid enters tubing. Medical Disinfect Wipe - The cuff may be wiped down with a mild disinfectant wipe (e.g. Sani-Cloth®) and line dry. Why do Plus cuffs have a larger range than a Long cuff? Range of fit depends on cuff bladder size. According to the American Heart Association, the ideal cuff should have a bladder length that is 80% and a width that is at least 40% of arm circumference. When arm circumference is large, these dimensions are impractical, which has prompted the AHA to suggest adjustments to the 80%/40% rule in these cases. Previously, Long cuffs achieved a greater range of fit simply by providing more material to wrap around the arm. Without increasing the bladder size from the standard size cuffs, the range of fit increases, but the occlusion capability of the cuff is limited because of the limited bladder size. The new Plus cuffs have a larger bladder, following the AHA guidelines for large arm circumferences. This allows for a much greater range of fit, while maintaining accuracy of blood pressure measurements. Pickering, T., Hall, J., Appel, L., Falkner, B., Graves, J., Hill, M., Jones, D., Kurtz, T., Sheps, S., Roccella, E. Recommendations for Blood Pressure Measurement in Humans and Experimental Animals. (2005). Hypertension, 45, 142-161. What is the difference between a standard cuff and a Plus cuff (i.e. Adult and Adult Plus cuffs)? A Plus cuff has a larger bladder size and longer length, which allows for a greater arm circumference range. Learn more about the importance of using disposable blood pressure cuffs to reduce the transmission of Healthcare-Associated Infections in your practice. Did you know the average cost of HAI's per patient is $23,226? Meanwhile, the cost of a disposable blood pressure cuff is only around $3? Protect your patients and your bottom-line by using disposable blood pressure cuffs and be sure to share this infographic with others in the healthcare industry. Discover the Difference with Vinyl BP Cuffs Today! 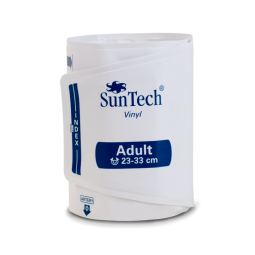 Request more information about Vinyl BP Cuffs for use in your office.